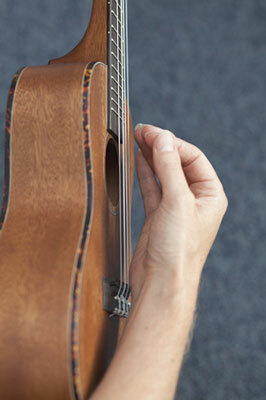 Chnks are muted strums and are great ways to add variety to the sound of your ukulele strumming. You play them as down strums, but instead of letting the chord ring, you immediately bring the underside of your strumming hand down on the strings to give it a chnk sound. The chnk technique can be quite tricky to get right because you’re required to do two things at once with your strumming hand: strum the strings and stop them ringing. You can hear how it sounds in the chnk audio clip. If a composer calls for a chnk, x marks the spot, as seen in this strumming pattern, where each chnk is represented by an x.